450g frozen berries (strawberries or raspberries or a mix of both), you can also use fresh berries if available. Fresh strawberries and mint leaves or anything else you prefer. Start by taking out the frozen berries and leave in room temperature whilst making the crust. Mix almonds and all the seeds in a food processor until forming crumbs. Remove the seeds from the dates and add to food processor together with shredded coconut, cacao powder, coconut oil and sea salt. Blend until a sticky mix. Press into the bottom of a spring-form pan and put in the freezer for at about 1 hour. Mix shredded coconut in food processor until butter-like consistency. Add berries, banana, lemon juice, coconut oil, vanilla bean, chia seeds, coconut milk and honey and blend to a smooth mixture. Take out the spring-form pan from the freezer and spread the filling on top of the crust. Put back in the freezer for at least 1 hour in order for the filling to settle. Take out and decorate with fresh strawberries. 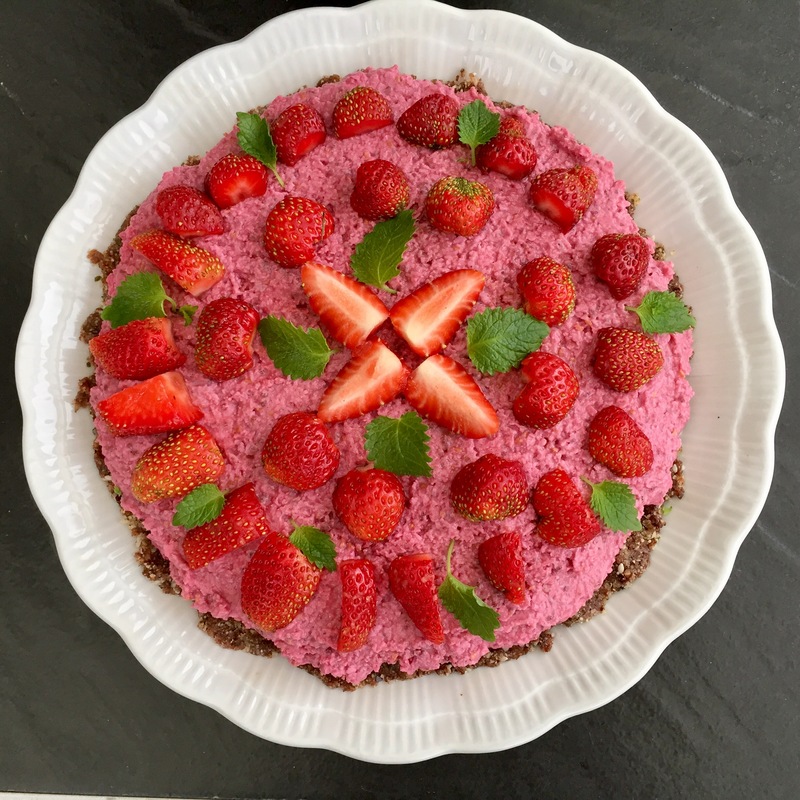 This strawberry raw cake can conveniently be prepared a few days in advance and kept in the freezer. Just make sure to take it out 2 hours before serving and decorate with fresh berries.